Everyone would say of course not. But this is a myth promulgated in French speaking countries. Who knew the French were as uptight about these things as Anglo-Saxons. In other cultures babies come out of cabbages I was told. What if storks did deliver babies? Can we prove it or disprove it using logical and scientific arguments? In my last year of high school my math teacher hero explained to us the difference between correlation and causation as follows. It involves storks, babies and fireplaces. To prove the stork theory scientists correlated the number of babies being born in houses with storks sitting on chimneys. The correlation was staggering. 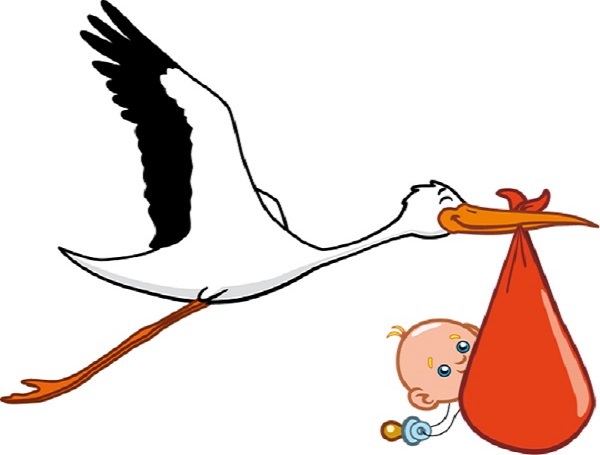 Conclusion: babies are delivered by storks! A more reasonable way to explain that correlation is that people who care about their babies will heat up their home by putting an extra log in their fireplace. And hey storks like it nice and warm and cozy. So they like to plunk their bodies on a nice source of heat caused by families having babies. If there were no storks on chimneys at all this theory would have been debunked at the start: if there is no correlation there is no causation. This no-no argument is at the crux of the scientific method. People do not always get this distinction and it makes for sensational press, pseudo-science and manipulative politicians. It is just a relation between two quantities that we can measure. Less rainfall is correlated to fewer apples. More castrated males are correlated to fewer kids being born. And we think automatically: less rainfall causes fewer apples. More castrated males cause fewer kids to be born. In this case correlation seems to be the same as causation. In 1967 Sweden decided that people should drive on the right hand side of the road instead of the left hand side. This despite that a referendum held in 1955 largely voted against it. Swedes expected chaos and more accidents. Well guess what? The accidents went down. That is an unexpected correlation that disproves the causal argument that drastically changing driving habits increases accidents. Why did the number of accidents go down you may ask? Because people were paying more attention! That is why we should ban stop lights. After 9/11 the number of car accidents went up because people were afraid to fly and drove cars instead. My wife joked that on my trip just after 9/11 on my way to the patent office in DC it would be just me and other mathematicians on the flight. She was right. I loved it: I could stretch out and talk about Galois Theory with my fellow passengers. Plane travel is the safest way to travel correlation wise by the way. Playing the lottery is extremely highly correlated with losing your money. Yet non-mathematicians still play the lottery. The lottery should replace taxes so mathematicians do not have to have offshore accounts. Here is another fun example. According to some Danish scientists ice core samples report that Co2 increases after the temperature increases. They report a correlation. That does not mean that temperature increase causes Co2 increase. But it disproves that Co2 increase causes temperature increase. Of course this is assuming that these ice core sample measurements are reliable and not funded and manipulated by sinister oil companies. So a single experiment if validated by the scientific community can completely destroy the “Global Warming Theory.” Of course this will never happen because the science is fuzzy and involves too many messy details that hurt my brain. But the logical argument is as follows. If A is not correlated to B then A cannot imply B and B cannot imply A. That is the bottom line of scientific theories: you cannot prove them you can only disprove them. There are no “Laws” and consensus. The party goes on until you get an Archimedes, a Galileo or an Einstein to crash the party but then you start a new one… Don’t get me wrong I believe in gravity, I believe in evolution, I believe in DNA, etc. And I definitely do not believe in creationism as a scientific theory because you cannot disprove it. This is the essence of Kuhn’s “paradigm shift” theory. When people call science “just a theory” it is the biggest compliment because it can potentially be falsified. The rest is just non-sense babble in the scientific arena. But it can be fun and helpful in other human endeavors. I like absurd literature like Beckett and Dostoyevsky for example. This blog was inspired by the following YouTube video.